Greener Pastures Ahead for Rescued Nebraska Horses? Just got this news report from the Humane Society. I'll have details and photos later -- maybe in tomorrow's newsletter. I know it's a long shot, but if any of you happen to end up adopting one of these horses, PLEASE let me know. I'd love to do a story on you for YOUNG RIDER magazine! BRIDGEPORT, Neb. (April 23, 2009) – More than 210 wild horses rescued last week from the 3-Strikes Ranch are gaining strength and putting on weight at their temporary home at the Bridgeport Fairgrounds. Necropsy results are back for several of the horses found dead on the Alliance, Neb. property. The necropsy results demonstrated significant fat and muscle atrophy, especially around the heart. This type of atrophy is consistent with starvation. The deceased horses also suffered from extreme parasitic infestation. Local veterinarians who delivered the results stated that pathology reports show no poisons in the horses’ systems. The horses were initially seized by the Morrill County Sheriff’s Department, but since their rescue have been handed over to the custody of Habitat for Horses. Nearly 210 horses were initially rescued from the ranch, but the number of horses continues to increase because of births. The Humane Society of the United States, Habitat for Horses, Front Range Equine Rescue, The Bureau of Land Management and local volunteers have all come together to rescue and care for these animals. The HSUS will continue to provide staff and volunteers to care for the animals until they are sent to foster care or permanent homes. Any person or organization qualified to adopt wild horses who may be interested in taking in one of these animals should contact Hillary Wood of Front Range Equine Rescue at 719-481-1490. A pregnant mare on the verge of giving birth and two other wild horses were found shot to death near Sundre, Alberta, according to the Royal Canadian Mounted Police. More than 22 wild horses have been killed in Alberta in the past four years. Rewards are offered for information leading to those responsible. If someone -- a teacher, a parent, a sibling -- hadn't taught you and me to read, would we be "talking" right now? How has reading changed your life? Teachers, librarians, writers (and students!) can get a little beaten-down about their work, so when I give presentations, I LOVE giving them a fresh look at the IMPORTANCE of what they do. Have books been your friends when others failed you? Feel free to get as personal as you like, or as silly, just be truthfu. You can send me your answers here at the blog (tell me if you don't want it published) or email it to be at farleyterri@aol.com. Has reading been a safe place when the roof of your life was caving in? Or, like me, has reading helped you find your passion? Thanks, and don't be surprised if I post some of your answers over my computer for inspiration! p.s. I LOVE the art above and found it posted all over the Internet, but couldn't find an artist; if you can, please let me know & I promise to give credit where it's due! I'm putting another place on my list of lands I must visit. Wild white horses, wild black bulls roam the marshlands here in Wild Western France . Read this article and make plans -- if only in y(our) dreams! When you get to that page, look at the lower left row of numbers. I think you'll see some familiar faces on page 6. I think I've been very lucky with both of them! What do you think of their other work? I'm back home after a very busy and very FUN weekend at a Virginia City writers conference. I took some visitors out to see wild horses & will post photos soon! When you read this I will be up in Virginia City (not far from the Phantom's old territory) at a writers conference called WHERE THE WILD THINGS ARE with a very cool group of writers. Some have names you'll recognize, such as Jane Yolen, Suzanne Morgan Williams, Lynda Sandoval, Ellen Hopkins, Susan Hart Lindquist and those are just a few I know will be there. No doubt there will be some who'll surprise me! Look for the Saint Mary's Art Center. That's where we'll be. My understanding is that it wasn't what was in the vitamin shots, but the amounts of one ingredient that killed the horses. I saw my first polo ponies in action this summer and they were magnificent. Some of you may remember that I found out one of the polo ponies had been bred on Dahana Ranch in Hawaii. just like Hoku on WILD HORSE ISLAND. Looks like a pretty fun summer job, doesn't it? Into something rich and strange..."
How cool is it that BOOKS FOR TEENS just did a great review of my SEVEN TEARS INTO THE SEA. Here's one of my favorite parts: (she) "...did a great job incorporating the ancient Celtic stories with a modern girl's life..."
Enjoy the beauty of sand and stallions here: Roberto Dutesco's art . Artist Roberto Dutesco's portfolio of horses reminds me so much of the herds of Shackleford Banks and his creations have been shown to benefit a number of humane causes! Here's a sunny room decorated with Dutesco's portraits of horses. Wouldn't you love to walk into the next room and find them in your house? An author friend of mine is having a cool contest. It requires major imagination! Told you it was a cool school visit! 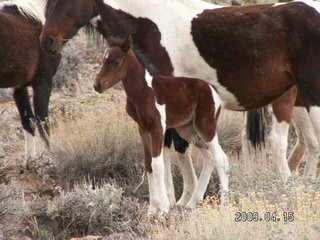 If you've always wanted a wild horse, but live far from sagebrush country and think adoption days like the ones I write about in my books are too far away, hold on to your cowgirl hats! Visit this page for adoption days in North Carolina, New Jersey, Michigan, Illinois, Wisconsin and Vermont. I checked several flyers and saw adoption fees range from $25 - 125, and the higher end of that range is often for 1-3 year olds who have already been gentled. Just look in the graph box & click to take a look at a flyer for an adoption day near you. Below that box are the requirements for corrals, shelters, etc., but you may already know some of those from DESERT DANCER and other books! If anyone gets the link on the far right side of the page, for the Internet adoptions to work, let me know! It's been a little skittish with me. If YOU attend an adoption day, please take notes (pictures, too!) and share the excitement with the rest of us. Isn't it amazing what an open heart can do? Here's a link to live streaming of a Bald Eagle on her nest in the Hancock Conservations Center in British Columbia. I took some photos -- like this one -- of the real Phantom on the first day I saw him. I HOPE one of you reading this will win! I just saw a post on Powell's Books in Portland (I was there this time last week! )about a contest and you are the experts who should enter! Can you help with this Phantom question? Let's see who can track down the answer to this question FASTEST! Now I have a youngster who wants to learn about the brand on my mustang, and I cannot find the info I used out of one of the P.S stories that taught me to decipher the brand myself! Can you recollect which book has that in it? Thanks! I'll be watching for your answers! I got home from the Pacific Northwest last night and though I had a wonderful trip, I was pretty happy to sleep in my own bed. Today, I've got LOTS of catching up to do, but I wanted to "talk" to you first. and for those of you who aren't on MySpace, I'm trying to track down the video elsewhere. I would love to have a still of the part where Chilly kisses Palomino! More about my wonderful trip later! I hope to have some photos, too! I wish I could meet ALL of you the way I've been meeting SOME of you since Saturday! During my first hours off the plane in Portland, Or., I went to a huge (blocks long & stories high) bookstore named POWELL'S, and met my readers. Some had driven for hours for my quick "drive by" signing and we talked for a long time together. They brought well-read (and well LOVED, they said, which made me very happy) and let me sign them. My friend Melissa Farlow, the amazing National Geographic photographer who photographed wild horses all over the West -- including the real Phantom -- came by and we brainstormed a possible book. Not alone, either, we included a reader who was sitting with us! So much fun!!! After that, we stopped at a Borders book stoand saw a girl standing tip-toe to reach a top shelf and my friend Suzanne "BULL RIDER" Williams asked "Do you like those books?" and the wonderful girl said, "I LOVE these books!" so I introduced myself. And we had a great time talking. We stopped some other places -- totally unplanned -- and were lucky enough to keep meeting our readers. And the booksellers were so nice! They treated us like rock stars! We made a presentation at Third Place Books in a wonderful community space with a stage, a projector for my PHANTOM film,a food court, library, community college -- and amazing people. There, we had Roseanne Parry with us, too. She wrote HEART OF A SHEPHERD, another neat Western book, featuring sheep. So, we had a horse author, a cow author and a sheep author! A former favorite student of mine (from Reno!) was having a snack at the community center food court and recognized my voice and came over to say HI! More later, all, I just wanted you to know I hadn't forgotten about you. It's late, but I'm still packing for my Pacific Northwest book tour/ road trip! I had a great morning with a crowd of home schoolers at Barnes and Noble and it's taken me a while to settle down. While I'm on the road, I'll do my best to keep up with the blog & email and I really hope I meet some of you. If you live in Illinois, you can be proud of your state legislators, because they stood firm against an attempt to re-open the chamber of horrors known as the DeKalb horse slaughter plant! This is one more win for the horses, but are you as surprised as I am that this war has so many small battles? I wish that Americans could vote, get a final decision, and move on. Until then, thanks so much to all of you who keep fighting. Sorry that my April Newsletter will be one day late, but it's on the way now!